Click on images to see larger versions of pictures. The plan was a good one, at least until step 1, "leave a car at the end of the hike." We arrived at the terminus of our hike, the Boulder Oaks Campground, to find both the campground and the parking lot closed. 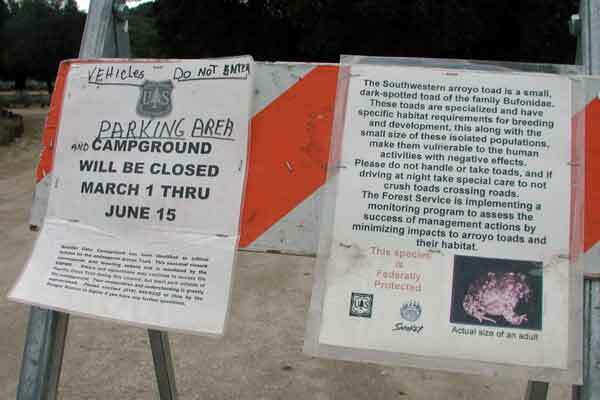 How did we let it slip our minds that this was mating season for the federally protected arroyo toad? Without ranger intervention to guide us, we made an executive decision and parked the car in a wide shoulder area of the road a hundred yards from the blocked entrance to the campground. We prominently displayed our Forest Service Adventure Pass in the windshield, hoping any Ranger or Sheriff deputy happening across our abandoned car would understand hikers would be back for it. We just hoped the car would still be there in two days time. We left Chuck's car there, loaded the four of us and our packs into our Camry, and headed up the Sunrise Highway to the trailhead. Our first pick for a starting place in the Laguna's faired no better: the Burnt Rancheria Campground we had planned to start at was also closed, this time for seasonal construction. The Laguna Mountain Recreation Area is full of pullouts, however, so we just went a little further up the road to the next parking area, which was the Desert View Picnic Grounds. We guessed there would be trail access from the picnic grounds to the Pacific Crest Trail running parallel to, but just west of, the road. Here Doug and PJ try to put on happy faces as they shoulder their packs for the first time (surprise! yes, you're expected to hike carrying all that weight) and are asked to stand around and pose for posterity. Heck, let's walk 100 ft down the road (in the wrong direction) and get a picture next to the elevation sign while we're at it. Sure we've got Chuck's GPS to record elevation for us, but the GPS doesn't make for as compelling an image on the web. Starting location and elevation thus documented, it was time to start, although the boys probably could have used a rest stop after all the standing around fully loaded. With cloud cover and a bit of wind, it was chilly up here standing around before hiking. 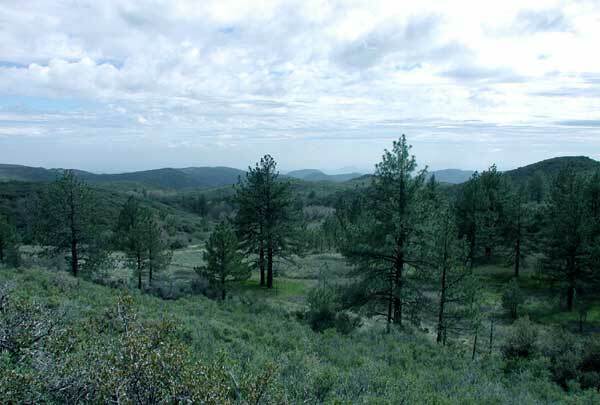 The Laguna Mountain Recreation Area is an area within the Cleveland National Forest with many miles of hiking trails, campgrounds, picnic areas and overlooks along the crest of the Lagunas. Because it is so popular, camping is not permitted along the trails, but only in designated campgrounds. 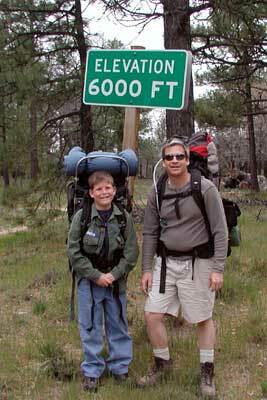 We started our backpack here because of the elevation (i.e. it was all downhill from here) and the trail's proximity to the road. But before we could bed down for the night, we would have to put some miles behind us and exit the Recreation Area. The flora of the Lagunas is pine forest. Because it is lower and drier, it is a more sparse forest than I grew up with in Los Alamos, but this is as good as the forest gets in San Diego County. Lunch was just a mile into the hike, at the aforementioned Burnt Rancheria Campground. 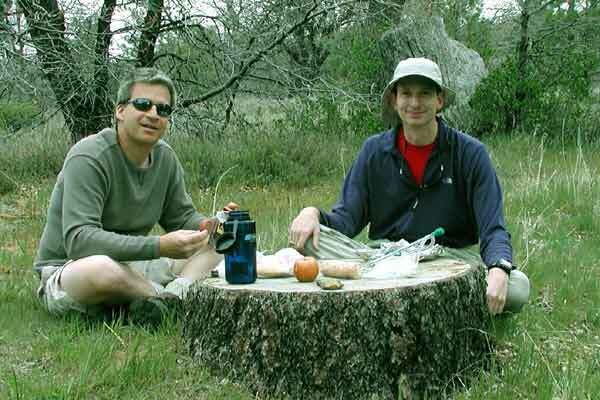 Keith and Chuck chose a stump for a table and the ground for chairs, while the boys sat on a felled tree. 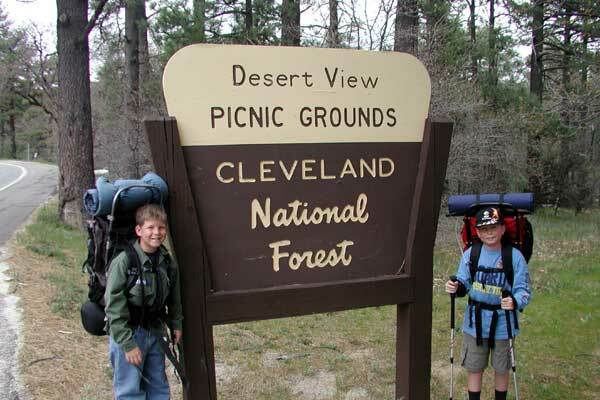 Did I mention this was the first backpacking experience for either of the 10 year olds? And carrying 25-30 pounds when you only weigh 90 takes a little getting used to. 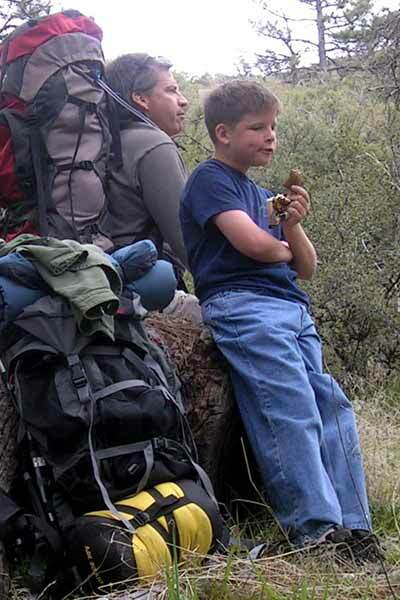 The point of the entire expedition was for the boys to have a fun first backpacking experience, so we ended up taking a lot of breaks as we began. Here Keith demonstrates to Doug the concept of resting without taking the pack off, by having it rest on something other than your hips. Doug, in turn, demonstrates that he wants his pack off and another snack. 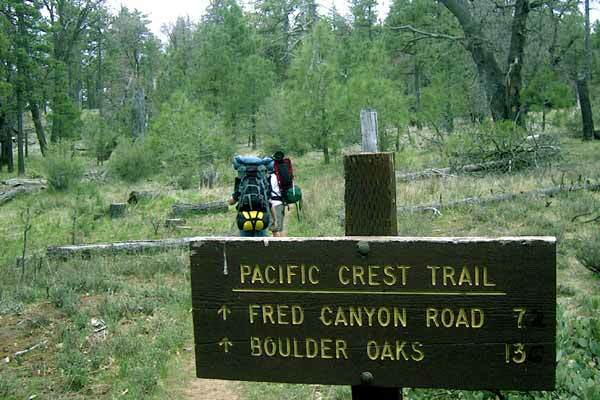 Coincidentally, the weekend closest to Doug's birthday is always the traditional start to the Pacific Crest Trail Season. As we were hiking south on the PCT on a Friday, hundreds of hikers were gathering at Lake Morena for the start of their border to border trek. We were section hikers, backpacking just a section of the trail; they are thru-hikers, hiking the length of the PCT from Mexico to Canada. Through-hikers start at the south end the third weekend in April because, apparently, there's a good chance the snow will have melted enough in the Sierras by June to be passable. We looked forward to meeting through-hikers in the next two days. Someone who wanted to be more exact added two tenths to the first measurement and six tenths to the second. This must have been a couple miles in, because by the time we exited at Boulder Oaks, our parking spot, Chuck's GPS had us at 18 miles. You can tell Doug from behind by the yellow compression sack that holds his sleeping bag. 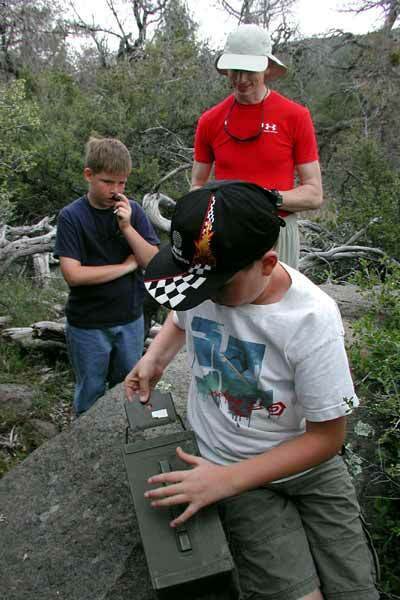 No outdoor activity that includes kids and a GPS can be considered complete without doing a little geo-caching. And I'm not sure the kids are even required. Chuck hit the Internet before we left San Diego for listings of geo-caches near our hike. Friday afternoon we dropped out packs by the trail and went out after a cache a couple of hundred yards off the trail. PJ is about to open it and see what treasure lies within. The rules are you sign the book, then take a trinket while leaving a trinket. We forgot to bring any thing to leave, but we did take the personal size hand sanitizer as very practical. We used it the rest of the trip, too. 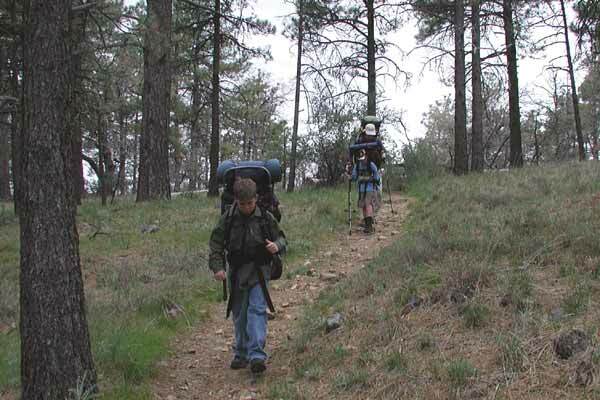 Didn't have GPS or personal hand sanitizer when I was backpacking as a Boy Scout. We had purposely chosen a section of trail that was mostly down hill, so we were quite naturally losing elevation as the miles ticked by. As we came to the top of Long Canyon, the pine trees were definitely getting shorter and further apart. We were transitioning from the pine forest to the predominant ecological zone in San Diego County, scrub oak and bushes. This is looking straight down Long Canyon, south-south east, towards Lake Morena. We can't see it yet, but it wasn't too long before we could see the Lake. 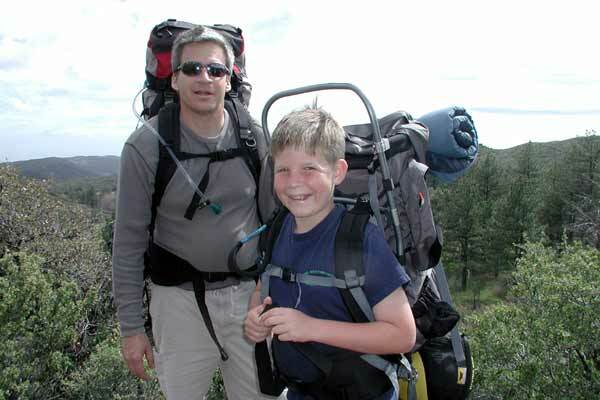 Time for a father son picture along that that same ridge as we left Thing Valley and crested over into Long Canyon. We lost some more altitude going into the canyon, to the point where the only trees left were lining the bottom of canyon along the vigorous creek. We found an excellent camping spot. It was a little closer to the stream than allowed, but 1) it was the only suitable spot available, and 2) it had clearly been used multiple times for just such a purpose, so I swallowed my wilderness-ethic pride and we bedded down for the night. Compliments and condemnations may be forwarded to VirtualSherwoods.com, preceeded by 'Keith@'.